Fall 2011 issue of The Journal. 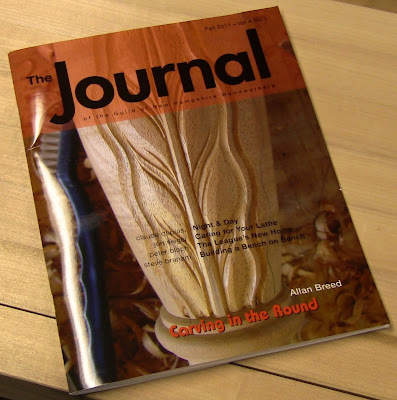 I'm very pleased to announce that Close Grain is now a column in The Journal of the Guild of New Hampshire Woodworkers. This is a gorgeously-printed magazine published three times a year for Guild members. It extends Close Grain to those who prefer the permanence of hard copy. Editor Jim Seroskie had seen me give a demonstration of dovetailing to the Guild's Hand Tools subgroup and picked up one of my cards. A couple of days later, having perused the blog, he called to ask if I would be interested in turning it into a column for the Journal. He said there were a number of posts that could serve as the raw material for articles, and he liked my emphasis on hand tools. I didn't hesitate. The Guild is an outstanding organization, consisting of a broad mix of hobbyists and professionals, with some very talented and accomplished members and active subgroups. They're also open to members outside of New Hampshire. Click here for information about membership, and here to join for $45 a year. Thank you, Jim, for the opportunity! He also let me include my blue stacked-saws logo on the column heading. This is my first real foray into print media. 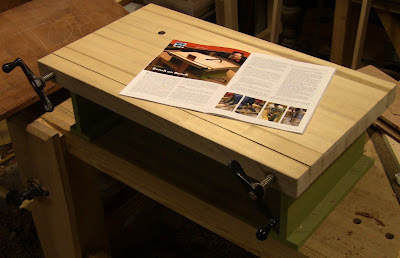 My post on using a ryoba for sawing tenons was turned into a Tricks Of The Trade entry in the October, 2010 issue of Popular Woodworking Magazine (and selected as the winning entry for the month, earning me a nice Lee Valley gift card, thanks, Kari! ), and I had a letter printed in the December, 2011 issue of Fine Woodworking arguing for hand tools over benchtop sanders, but this is more extensive. The inaugural column arrived today in the mail, based on my bench-on-bench project. I had used the BOB during my demonstration, and a number of onlookers had expressed interest in it. The first column: Building a Bench on Bench. The article is 6 pages long. The bench-on-bench article on the bench-on-bench on the bench. It's great to see my name in print! 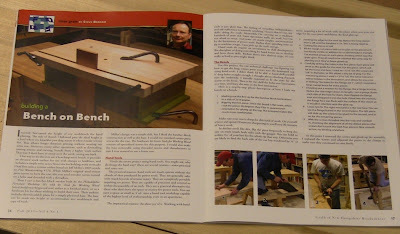 Plus, I'm flattered to be in the same issue as Al Breed, winner of the SAPFM 2012 Cartouche Award. The opportunity to spend time with people like Al is one of the real benefits of Guild membership. Congratulations Steve on having your incredibly well thought out blog posts published in the journal. You provide something wonderful to the on-line woodworking community, and now your work will reach even more viewers/readers. Well done!